Free Download Xilisoft Audio Maker 6.3.0.0805 - Convert audio files, rip and burn CDs. 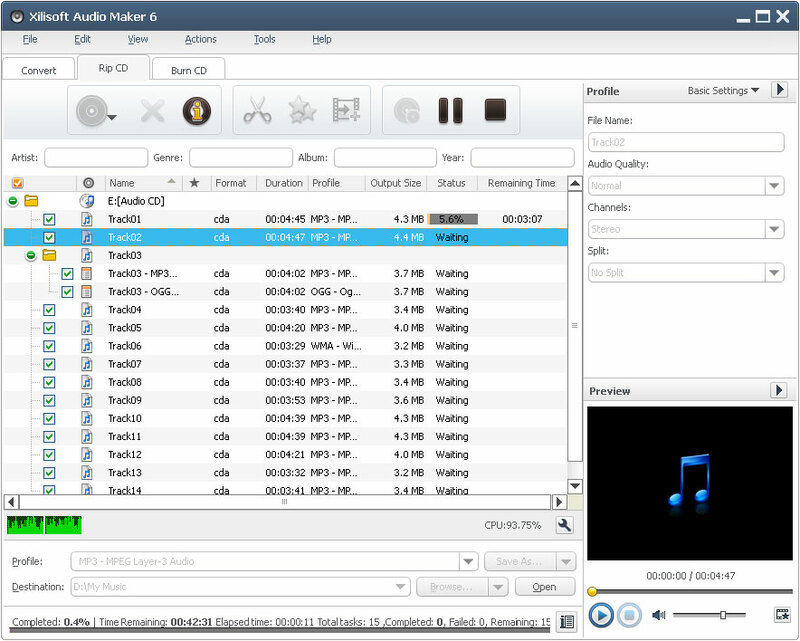 Xilisoft Audio Maker is an all-in-one solution for processing of audio files. It includes an audio converter, a CD ripper and a CD burner. The tool supports a selection of popular audio formats, such as MP3, M4A, WAV, WMA, MP2, OGG, AAC, AC3, APE, FLAC, AU, etc. Each of three tools has its own tab - Convert, Rip CD, Burn CD - in the main window to make using the application more convenient and easy. You can start with converting your audio files. The program offers a variety of predefined output profiles grouped into three categories: mobile phone, general audio, lossless audio. But you can adjust the bitrate, sample rate, codec, etc. as desired. There is also an opportunity to add such metadata as title, author, comment, title, and track. You can convert only part of your audio file by setting the start time and duration of the part you want to process. While using the CD ripper you can retrieve CD information from CDDB. As well as audio converter, it allows adjusting output settings and clipping audio. In the third tab, you can burn music CDs in MP3 or WMA formats from AVI, MPEG, WMV, MP4, 3GP, ASF, MOV, RM, MP2, MP3, WMA, WAV, AU, M4A, RA, OGG, and AC3 files. Xilisoft Audio Maker supports conversion and ripping of multiple tracks to multiple formats simultaneously, splitting tracks, clipping audio segments, adding of audio fade-in/out effects, adjusting volume, adding other audio effects, such as band pass, chorus, flanger, echo and speed for the output audio. Super high audio conversion speed is achieved due to multi-core CPU processing and multithreading. - multi-language interface and multi-skins.